Now I confess I haven’t actually done this one but it ties in with a blog post a read recently over at One Handed Writers, they were discussing how they had a scent for each of their characters in their minds as they wrote about them and I think that is part of what I get from this idea. 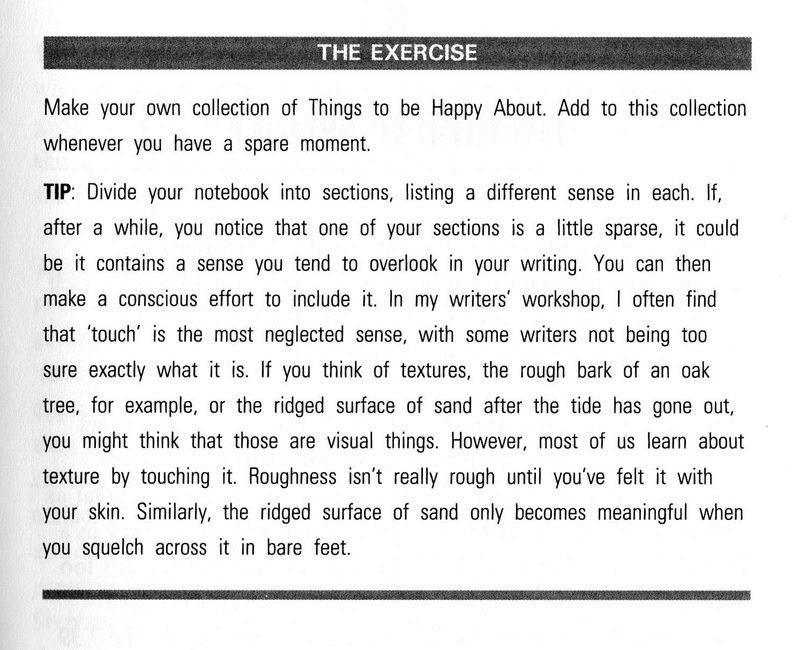 To me this is not so much a five minute exercise as an on going project so what I intend to do is grab a nice new clean notebook and divide it up into the senses then actually make notes of various sensations. I guess it will be a little like saying something tastes like chicken then trying to explain to someone who has never eaten it what chicken tastes like. I think something I am guilty of at times is assuming that people share my experience of things a prime example is if I were to talk about the smell of a fire burning, my fires when I burn them tend to have a lot of rose wood in them where I have hacked back the wild rose that grows in my garden yet I know if I were burning pine boughs it would smell differently. I can really see how this one will help me create more layers to my writing and especially my poetry and the idea of starting a sensory journal is quite exciting. So what do you think is this something that could work for you? I once took a class where you had to peel an orange and write the description of what it was like to you. It’s easy to forget those basics of description when you get going. It makes a lot of sense, esp when you are describing scenes in your book where the sensory perception of the character guides the reader as to what is happening. That sounds really useful and fun. I may have to try it. Scents are very evocative so yes, it certainly makes sense to include them . I try to incorporate all the senses in every scene or chapter at the very least, but it sure is difficult! For me, taste is the most difficult to include only because my characters aren’t always eating/drinking in the scenes so I have to figure out ways around that. Not easy. I was surprised to read that “touch” was the most neglected sense. If I ever stop writing such “quick” stories, maybe I’ll find characters who do stop to smell, touch, and taste more. Interesting exercise, Paula. I might try this one.